of a species extending west, having colonised Serengeti recently. It's been a long time since I posted anything here - sorry! I have another common birds post in progress, but just keep failing to finish it off. In the mean time I thought I'd talk about one of my own papers that came out a few weeks ago that explores how Tanzanian bird distributions are changing (sorry, it's pay to view, but if you want a copy email me and I'll send it!). This analysis is a fairly major result of my collaboration with the Tanzania Bird Atlas and represents the combined efforts of a very large number of people, volunteers and professionals, who contribute invaluable data to Neil and Liz Baker - I know some of you read this, so firstly, thank you, and secondly, I hope you appreciate seeing how we can use these records to do interesting and (I hope!) useful research. There are very few birds I don't like to see, but today's common bird is an exception - the Indian House Crow, Corvus splendens. Actually, that's probably slightly untrue, as I have been to India and I was perfectly happy to see the species there. In East Africa, however, this is not a species I'm ever happy to see. Not because there aren't interesting things to say about it, of course, but because it really belongs in India and seems to cause a number of problems elsewhere. First though, identification is fairly simple: the house crow is a medium-large all black and grey bird, usually found in flocks in towns all along the coast and, in some areas, invading inland too. 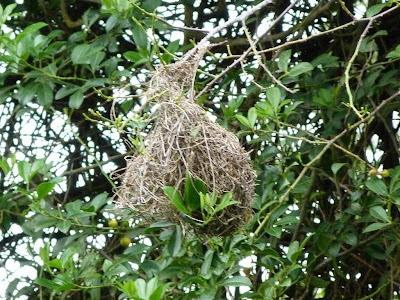 It is very loud, with a persistent "Carr, Carr, Carr" call that is the constant sound of Dar es Salaam bird life... There are few confusion species in East Africa, the only other common species of crow being the black and white Pied Crow, which often hangs about with the house crow. 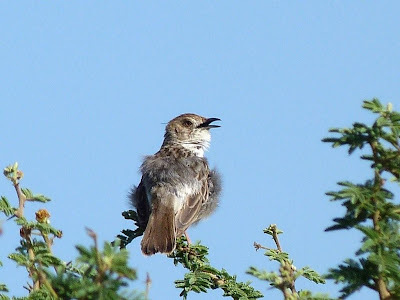 Common birds: Rattling cisticola and why birds hold territories? Rattling Cisticola, near Arusha, March 2011. Something of a birder's bird? Returning to my recent theme of common birds, what could be more suitable as the rains begin than a look a Cisticola chiniana? Whilst small, streaked and brown might make this something of a 'birder's bird', I'm happy to think there's plenty to interest everyone in this species too. First the identification. Let's be honest, Cisticolas can be something of a challenge to identify! It doesn't help that there are seven pages of nearly identical looking small, streaky brown birds in the fieldguide! Happily, there are better ways to identify Cisticolas than their looks - the key is always to listen. Most Cisticolas, and rattling is no exception, have fairly distinctive calls and once you know it their 'tee, tee, churrurrurr' call is a constant sound in the bush (click the link to find a recording on xeno-canto), especially during the rains when they breed. In the unlucky event that none are making any noises, you can usually be fairly confident in your identification of any moderately sized, streaky cisticola present in the drier bush regions as rattling simply because they're so common! They are surprisingly variable in size (sometimes appearing really rather small) and colour (from very grey to warmer brown - but never with bright chestnut on the wing or head) though, so don't be too taken in my any one feature if they're not calling. Lions: just big kitties really! 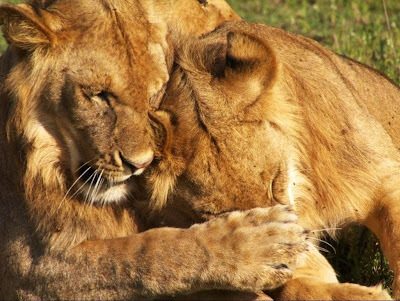 There have been a couple of lion stories in the news in the last week or two, and enough interest in them that I felt compelled to write something. First there was a paper by Craig Packer and many coauthors about lion populations in Africa, their current declines, and the possible role of fencing in protecting them. Then, shortly after, there was a letter in the New York Times by Tanzania's own Director of Wildlife, asking the US government not to list the lion as endangered, as lion hunting is crucial to their conservation in Tanzania. 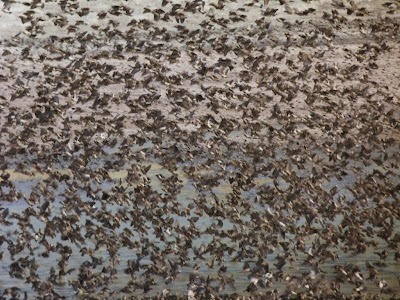 Common birds: Red-billed Quelea, commonest bird in the world? I've been struggling to think of the next common bird to do something interesting with, until the obvious solution came to me, possibly the world's most abundant bird, the red-billed quelea. So, first the identification. The most obvious thing about red-billed queleas are, as the name suggests, a large red beak! Apart from that feature, females and non-breeding males are rather nondescript, small sparrow-like birds. Breeding males are rather brighter, with the red bill surrounded by a black face and variable amounts of orange on the top of the head and breast, with otherwise sparrow-like brown streaks on the back and wings. 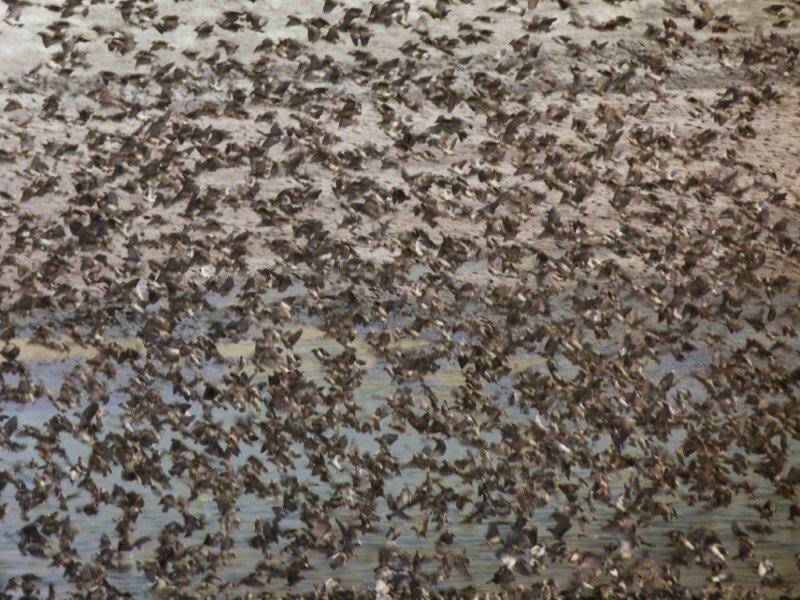 Perhaps the most useful identification feature though is the fact that you almost never see just one, but flocks of tens, hundreds or thousands of busy quelea all searching for grass seeds or drinking at waterholes. 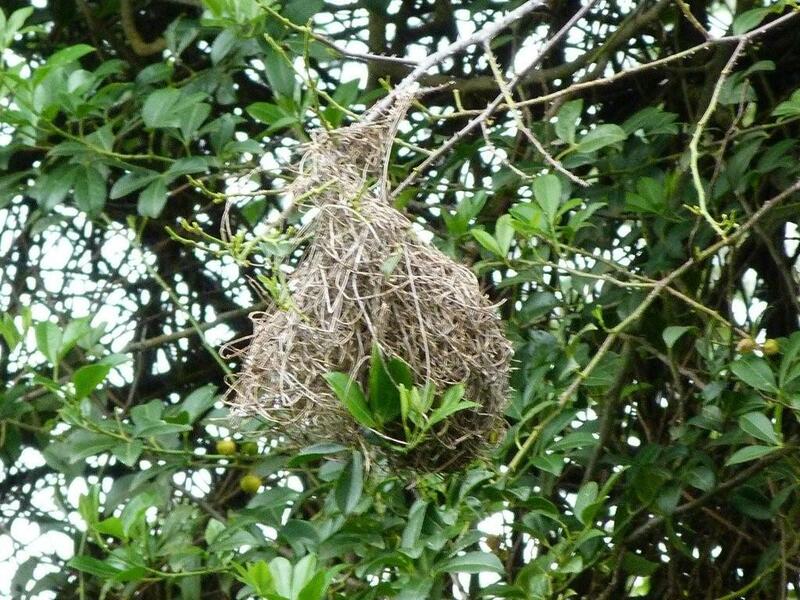 If you live on or near an East African mountain, you're very likely to have Baglafecht Weavers in your garden. Like most of the other true weavers, they're a basic black and yellow colour. The first thing to look at in weavers is usually the colour of the eyes and legs: in Baglafecht weavers you'll always see a yellow eye (easy to see against the surrounding black feathers) and pink legs. 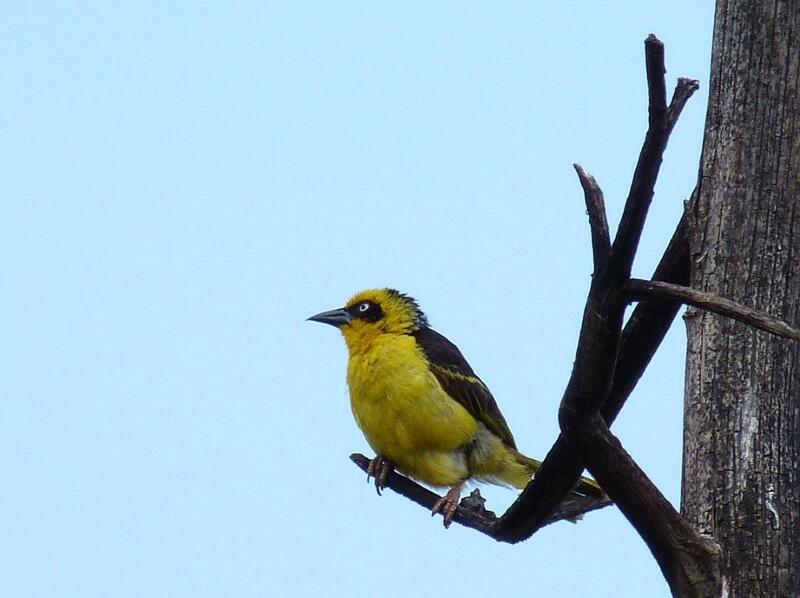 Males and females differ slightly: males in the population in northern Tanzania and Kenya have only a black mask on the face, with yellow on the top of the head right down to the (black) beak. Females have an all dark head. In northern Tanzania the back of both sexes is essentially black, with some yellow wing edges, in other areas of Tanzania the back is greenish/grey and not as strongly contrasting. Juveniles of all forms are rather greener and lacking in black, but still have the yellow eye. Like other weavers, they weave their nests from grasses in colonies of 5-15 pairs (not usually in very large groups) and males in the breeding season are pretty noisy with their rather scratchy and squeeky song! Two more challenges have been set since the last one, and I'm hoping to rise to each! The first was for the African Collared Dove, however that species (Streptopelia roseogrisea) from the drier north of Africa in the Sahel and in the Middle East is not found in Eastern or Southern Africa and I suspect request was for a Ring-necked Dove Streptopelia capicola which is indeed one of the commonest birds to be seen in the bush across much of Africa. The sound of the Ring-necked Dove is one of the constant backgrounds to a safari in the bush (if you don't know it, the "work harder, drink lager" refrain is available here) and it's actually this distinctive song that is the easiest way to identify the species from among a number of confusingly similar species. The ring-necked dove is a medium sized, grey dove. It has a black collar around the back of its neck and is a paler grey white below, with pale edges to its tail. Unfortunately, that description is would cover just about any of the close relatives of this species, and (as well as listening to the calls) you need to look rather closer to identify the species correctly. 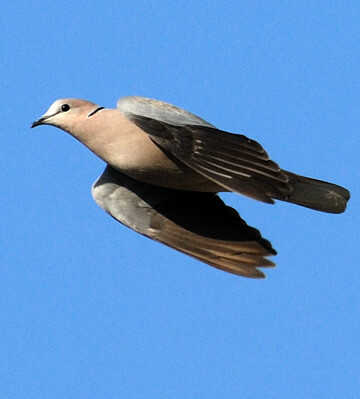 Firstly, look at the eye: if it is dark and not obviously surrounded by bare skin, you're probably looking at a Ring-necked Dove. White (not grey) edges to the tail and a generally pale grey would confirm the identity in eastern and southern Africa. If the eye is pale yellowish, with a red ring around it and there's a warmer brownish wash to the back and neck that contrasts with a grey head, you're probably looking at an African Mourning Dove (call) and if its got a dark eye in a bare purple/red patch of skin, and is overall darker looking, with grey tail edges, you're looking at a Red-eyed Dove (call: "I am a Red-eyed Dove").